How have Nordic values contributed to our idea of Europe? 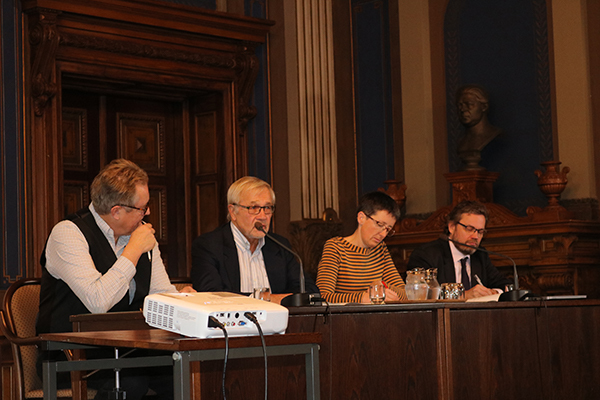 On 14 November 2018, the Council of Finnish Academies invited speakers from Finland, Denmark, Sweden, Norway and Great Britain to take a Nordic perspective on questions of identity, nationalism, migration and populism in Europe. 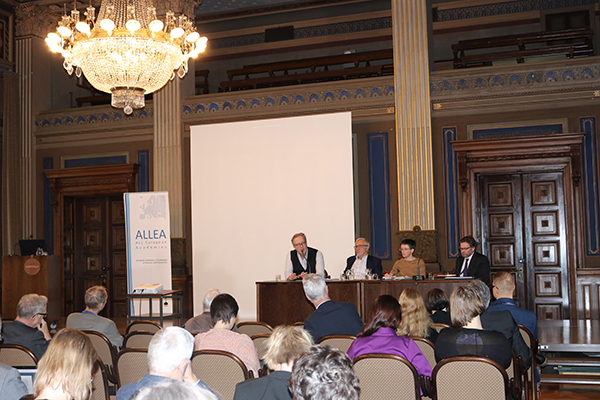 The symposium was held in Helsinki at the House of the Estates and forms part of the ALLEA series “Europeon Test – Narratives of Union and Disunion”, with conferences in various European countries. 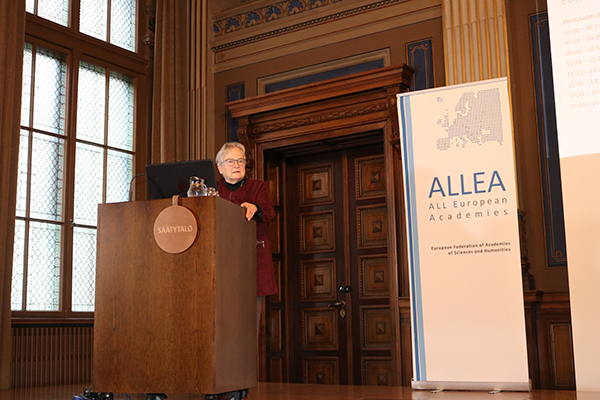 ALLEA Vice President Krista Varantola welcomes the audience of the “Europe on Test” symposium at the House of the Estates in Helsinki. In the opening addresses, Professor Jan Sundberg and Professor Krista Varantola, former chancellor of the Council of Finnish Academies and ALLEA Vice President, stressed the need for reflections on European identities in times of multiple crises and growing populist right wing movements in Europe and beyond. 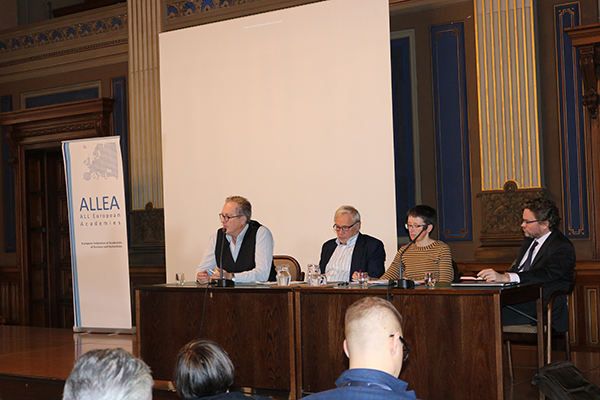 In the first session, historical trajectories of the Nordic countries in relation to Europe were examined by Juhana Aunesluoma, Bo Stråth and Mary Hilson. They pointed out that Nordic countries are quite diverse and each one has a distinct history of relations with Europe. Whereas only Finland is in the Eurozone, Denmark, Iceland, Norway and Sweden have their own currency. In parallel, Finland, Denmark and Sweden are part of the European Union, while Norway and Iceland are not. Some are constitutional monarchies, others republics and three out of five are in the NATO. ALLEA Vice President Krista Varantola illustrated this diversity in Northern Europe by describing Nordic countries as “a typical family that disagrees in words but nevertheless sticks together when they feel their values or actions are questioned or threatened from the other side”. Professor Mary Hilson from Aarhus University in Denmark argued that the narrative of a Nordic exceptionalism had a bidirectional effect in all countries. Like in other processes of (European) identity formation, “Nordic Europe” was considered a first step towards an integrated Europe. This narrative at the same time created new boundaries between Nordics and the rest of Europe. Nordic peculiarities such as a high level of public trust and openness towards other cultures further contributed to their integration in Europe. The discourse behind European integration is however being challenged or reshaped by the recent global economic crisis, conflicts over migration and mobility, as well as by the spread of populist movements in Europe. In the second and third panel discussions, these changing narratives were analysed. One of the statements was that migration is being blamed for problems that have other roots in the economic and social systems our societies are depending on. Populism and new nationalisms are built on the premise that such systems could be managed by isolated countries themselves. Speakers warned about this increasingly powerful but naïve narrative and called for a deconstruction of such arguments. In the concluding reflections, speakers agreed that new narratives are necessary to reinvent the idea of Europe in order to counteract these growing nationalist tendencies. Such voices threaten the achievements of European integration and therefore peace and stability. Nordic European values such as openness and institutional trustworthiness should be emphasised in such narratives. The Nordic welfare state, consensual politics and industrial relations, and a security community in international affairs could help to shape future narratives. 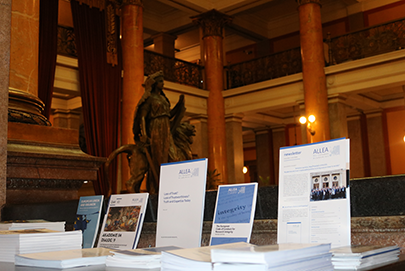 Inspired by a British Academy conference on “European Union and Disunion” in late 2016, the ALLEA series “Europe on Test: Narratives of Union and Disunion” has recently taken up the debate at the Göttingen Academy of Sciences and Humanities with the conference “Germany and Europe – Views from within and without” on 20 October 2018. The initiative seeks to address recent political developments and other aspects of relevance that may pose a challenge for the future of Europe as a community. The debate will continue at upcoming conferences in Torino at the Accademia delle Scienze di Torino on 11 and 12 April 2019, and in Warsaw at the Polish Academy of Sciences on 11 October 2019.